William E. Geeslin, 73, of Bloomington, Indiana passed away on May 25, 2018. Bill was born on October 8, 1944 to the late Ben Davis Geeslin and Mary Louise Walker Geeslin in San Antonio, Texas. He graduated from Brady High School in 1963. 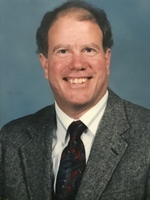 Bill earned his BA in mathematics from the University of Texas (1967), and his MS in Statistics (1970) and PhD in Mathematics Education (1973) from Stanford University. He accepted a tenure-track job at the University of New Hampshire in 1972 and remained there until his retirement in 2009, spending two sabbatical years in Athens, Georgia. He enjoyed the ocean and mountains of New Hampshire, but remained an avid follower of Texas and Stanford football his entire life. Bill’s scholarship focused on teaching probability and statistics to elementary school children, and he led grant-funded teacher training programs. Career highlights include a post in Washington, DC with the National Science Foundation and a research trip to China where he visited several schools. Bill loved to travel and his adventures took him from camping in Acadia National Park to wine-tasting in Napa Valley. Recently he traveled by train through the Canadian Rockies, took cruises in Alaska, the Caribbean and rivers of France, and visited Costa Rica. In retirement, he attended his grandchildren’s cross-country meets, soccer and hockey games, and violin concerts. Last May he planned a family reunion in Gulf Shores to celebrate his 50th wedding anniversary with all five grandchildren. He is survived by his wife, Eileen, his daughters, Kimberly Geeslin (Sean McGuire) and Melissa Snodgrass (Joshua Snodgrass), five grandchildren, Katie, Kai, and Matt Snodgrass, and Logan and Hayden McGuire, his brother, Richard, his aunt Georgeann Geeslin and several cousins. A memorial service will be held June 6 at 4:00 pm at St. Mark’s United Methodist Church in Bloomington. In lieu of flowers donations may be made to St Mark’s United Methodist Church (www.smumc.church), Wanakee United Methodist Camp (http://www.wanakee.org/donate), or the Michael J. Fox foundation for Parkinson’s research (www.michaeljfox.org).